Tarantino establishes the core relationship between the ex-slave protagonist Django (Jamie Foxx) and Dr. King Schultz (Christoph Waltz), a German dentist turned bounty hunter, as soon as the opening credits end. The most developed and rewarding relationship in the film, the Django-Schultz dynamic initially plays out as almost paternal, with Schultz teaching Django the bounty hunting trade as they hunt down the Brittle Brothers, overseers with whom Django has a violent past. Their first bounty, one taken out on the head of a sheriff in a small town in Texas, is informative and hilarious; Schultz has established an almost sanitary procedure for dealing with unsavory aspects of his trade, something that comes as a shock to Django. The morality of bounty hunting has become a non-issue for Schultz over time, something that he eventually instills in Django. What is the use of a moral compass in a setting where no one else seems to be paying attention to his or her own? As the film transitions from the Brittle brothers plotline to the major focus of the film, Django’s quest to rescue his wife Broomhilda (Kerry Washington), smart, compact moments like the killing of the Brittle brothers or overtly comical scenes like when Bennett and his gang argue about whether to wear bags on their heads as they raid Schultz and Django’s camp become few and far between, and when they do appear, they lack the strength of the earlier scenes. 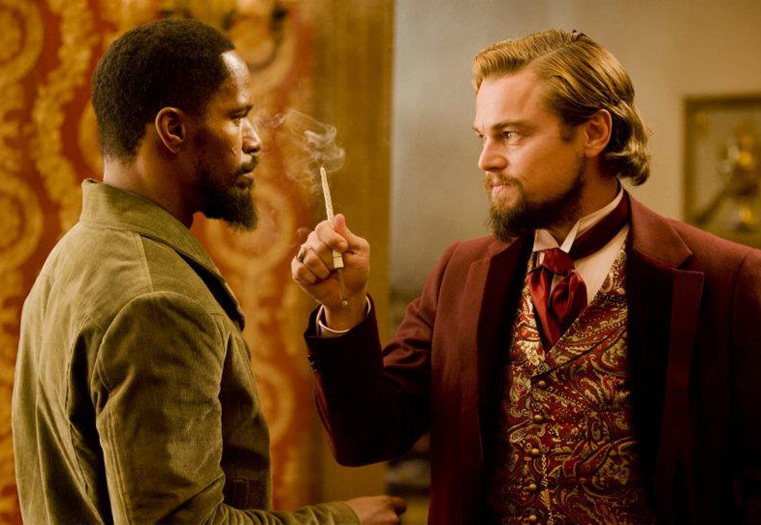 When Django agrees to play the role of Schultz’s expert on Mandingo fighting – the lowest of the low, according to Django, a man who trades in his own flesh and blood – in order to gain access to Candyland, the plantation where Broomhilda is held captive, the story loses the budding relationship between Schultz and Django, and Django loses the innocence and naïveté that enabled him to express moral doubts on the subject of bounty hunting and of killing for money. Jaded, Django sits in a Mississippi saloon with Schultz, calmly discussing their plan, the air outside so thick with cotton that it almost looks like it’s snowing in Mississippi. Django’s acceptance of the amorality of bounty hunting and the utility of killing en masse as a form of retribution for enslavement comes at the end of his personal evolution but is situated somewhere in the middle of the film. What follows is awkwardly paced, much more adventurous, and decidedly more uneven than the first half of the film. The introduction of Calvin Candie (Leonardo DiCaprio) and his slave Stephen (Samuel L. Jackson) is especially interesting, but their relationship is underdeveloped. The Stephen-Candie dynamic presents an interesting parallel to that of Django-Schultz; while Schultz is more even-tempered and calculating, Stephen acts as Candie’s protector, handling his business affairs and seeing the things Candie cannot or will not see. Stephen holds a privileged place within the plantation framework, but the intricacies of that position and his motivations for placing himself in that position are never truly explored. Django would have been better served with either a more generous hand editing the last half of the film or a division of the story into two separate films. Deeper explorations of the relationships between characters other than Django and Schultz – Django and Broomhilda, Stephen and Candie – would have helped to maintain the momentum established early in the film that dissipates once the action reaches Candyland. As the film stands now, Django, Schultz, Candie, Stephen, and all of the other characters that pass in and out of the story are nothing more than shadows of people. A deeper exploration of the motivations, emotions, and desires of all of these characters would also make it considerably easier to understand the film as a commentary on the institution of slavery. Django’s refusal to understand most of its characters as complex human beings, makes it difficult to understand the totality of slavery. Instead, it mainly focuses on the physical violence of slavery, offering hints of complexity beyond the whippings, beatings, and decapitations portrayed in the film. Django Unchained lays an uneven foundation for what could have been a more profound statement about slavery, but, for the time being, only portions of the film demonstrate the best of Tarantino’s aesthetic – an eye for superfluous, but somehow essential details, smart dialogue, and a sense of the grotesque – an inconsistency that leaves a film that pushes well over two and a half hours with a sense of incompleteness. Written by: Olivia Domba on December 28, 2012.